Spray 3 1/2- to 4-quart slow cooker with cooking spray. 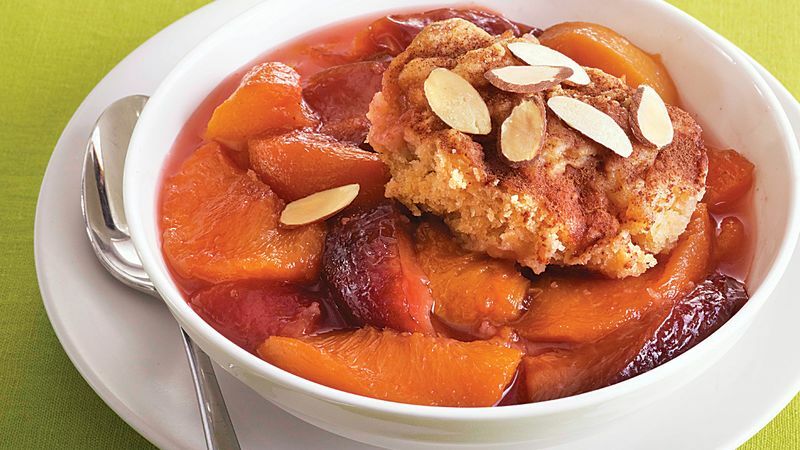 In large bowl, mix peaches, plums, 1/2 cup of the granulated sugar, the cornstarch, lemon juice and almond extract. Transfer mixture to slow cooker. In medium bowl, stir baking mix, remaining 1/4 cup granulated sugar, the milk and butter just until blended. Drop heaping tablespoons of dough into 8 mounds on fruit in slow cooker. Cover; cook on High heat setting 3 hours 30 minutes or until topping is dry in center and fruit is bubbly. Sprinkle cinnamon-sugar over topping. Cover; cook 30 minutes longer. Let stand 15 minutes before serving. Sprinkle with almonds.